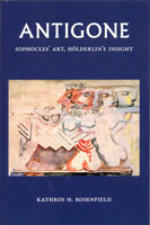 Title: ANTIGONE: Sophocles’ Art, Hölderlin’s Insight Author: Kathrin H. Rosenfield Imprint: The Davies Group, Publishers soft cover 224 pp. USD 24.00 ISBN 978-1934542224 June 2010 Following Friedrich Hölderlin’s insights, the author reveals an unnoticed historical detail – the epiclerate – that makes Antigone the heiress to the throne of Thebes. Creon’s actions acquire new meaning, as does Antigone’s resistance, and an almost Hitchcockian drama emerges from subtleties in the Greek text. Hölderlin brings us fully rounded characters, and we feel the thrill of real tragedy. Rosenfield argues that Hölderlin may have come closer to the spirit of Sophocles and the Athenian enlightenment than later, more scholarly, translators and critics, an argument that redeems a misunderstood translation of a major Romantic author and demonstrates that a comparative approach to literature – understanding a German poet’s approach to a Greek tragedy – can increase artistic pleasure and deepen our understanding of the often strange Greek mentality. Antigone is now available to an English speaking audience for the first time. It contains a specific preface for the English edition and a few stylistic changes making the essay easier to read for a public not familiar with the ideas of German Idealism. Contents Acknowledgments Introduction to the American Edition Introduction to the French Edition Chapter 1 Antigone—Young Girl or Queen? Digression: Whose Antigone? A digression on Hölderlin’s approach to translation Chapter 2 The War for Thebes in the Light of the Risen Sun Chapter 3 Creon, and the Formidable Tricks of Man Intermezzo: The Beauty of Antigone Chapter 4 Creon, Antigone, Ismene: The Great Debates Chapter 5 Friends and Foes: Haemon, Antigone, and Creon Chapter 6 Tiresias, or “Pure Speech” Chapter 7 Rhythm, Language, and Time in Hölderlin ’s Remarks on Antigone and Oedipus Bibliography Index Reviews “This splendid book, the work of a scholar deeply versed both in Romantic Germany and in ancient Greece, throws new and brilliant light on a fascinating work by two authors, Antigone by Sophocles and by Friederich Hölderlin. Few writers have enough knowledge, enough imagination, and enough sheer literary ability to pull off such a task. Kathrin Rosenfield has these things, and her work has the remarkable ability to open literature to students of philosophy while opening philosophy to students of literature.” —Carole Talon-Hugon, University of Nice – Sophia Antipolis “This commentary is permeated by an equally amazing, almost overwhelming richness of historical information and philosophical reflections which…always manage to return to the main line of interpretation and argumentation. But the ultimate surprise was the – quite fondly acknowledged – impression that such a complex book somehow managed to make for an unambiguously pleasant and engaging read. It is a book in which specialists and cultivated non-specialists can indulge.” — Hans Ulrich Gumbrecht, Albert Guérard Professor of Literature, Stanford University Author Kathrin H. Rosenfield is a professor in the Faculty of Literatura and Philosophy at the Federal University of Rio Grande do Sul in Brazil. She has long combined literary criticism with a practice in psychotherapy and an active career in the theatre. Her book Desenveredando Rosa won Brazil’s foremost literary award in 2007. Different versions of her book on Sophocles’ Antigone have been published in Brazil and France.